Advances in ecological science and increasing public environmental awareness have resulted in changes in the management of renewable natural resources. To achieve sustainable use of wildlife, managers need reliable, accessible and well designed data on populations, habitats, and the complexities of ecological interactions. The National Game Management Database (NGMD) was first mandated by the Hungarian Game Management and Hunting Law (the Act on Game Conservation, Management and Hunting (Act LV, 1996)) in 1996. Since then, the database has contributed significantly to several aspects of game management; from plan development to wildlife ecological research and education. This work has been conducted through the Institute for Wildlife Conservation at Szent István University. Store data on game populations and game management in a way that can be used for multiple analytical procedures. Provide input to spatial analyses and mapping. Facilitate decision-making and planning efforts at various levels of game management administration. Spring population data for red deer, fallow deer, roe deer, mouflon, wild boar, brown hare, ring-necked pheasant, and grey partridge. This data consists of spring population reports from the GMUs in late February, available from 1987 to the present. Game management reports for red deer, fallow deer, roe deer, mouflon, wild boar, brown hare, ring-necked pheasant, grey partridge, wild ducks (5 species), wild geese (2 species), and other hunted species (mainly predators). This data includes the bags, live-catches, available non-hunting mortality, game feeding, and costs of game management activities and incomes from hunting during the hunting season. Game management reports from the GMUs are available since 1986. Trophy scoring data for red deer, fallow deer, roe deer, mouflon, and wild boar provided by the National/County Trophy Scoring Committees. Data for each individual animal presented for trophy evaluation since 1990 is stored in the database. Maximum allowed population size and minimum huntable population size for red deer, fallow deer, roe deer, mouflon, and wild boar as well as the minimum huntable population size for brown hare, ring-necked pheasant, and grey partridge. Address and other data for each GMU. Detailed description of borders and game management maps of each GMU (digitalized, scale 50,000). Description and maps of the 24 management regions (based on the GMU maps), long-term (10-year) game management plans of the GMUs (1997-2007, 2007-2017), and regional game management plans of the 24 game management regions (2003). The design of the 24 game management regions based on multivariate analyses of game management and environmental data and input to the plan for the 24 game management. Forming a theoretical framework for the 3-level game management system, introduced in 1996/1997, as well as the development of the annual, long-term and regional management plans, and data input for the long term (10-year) management plans of the GMUs (1996-1998 and 2007). The determination of a maximum sustainable population size for red deer, roe deer, and wild boars in Hungary (1997-1999), and as a follow up, for the design and implementation of the big game harvest quota system launched by the Ministry of Agriculture (2002-present). The annual publication of "Game Management Database," a booklet containing the game population, game harvests, and trophy evaluation data for the previous hunting year. Providing game management data for students preparing thesis at colleges/universities (>150 theses since 1997). Providing information for expert witnesses in legal cases. The NGMD was developed on personal computers using commercial software, including the database format (Paradox 11 Relational Database Program, Corel Corp.) and software used for spatial data management and analysis (ArcInfo and ArcView GIS, ESRI Corp.). Using standard computer resources, the programmers developed the special applications for data input and statistical output (generally descriptive statistics for regions or country level). The NGMD is compatible with other data collected in various research and monitoring programs, and thus can be linked with data on forestry, agriculture, and nature conservation. This data includes agricultural land use maps, satellite images, CORINE land-cover maps (Institute of Geodesy, Cartography and Remote Sensing, Hungary [FÖMI], 2009), soil typological maps, forest stand maps from the State Forest Service, and Natura 2000 site maps, among others. In Hungary, the NGMD was the first operating database for wildlife management and nature conservation providing full GIS capabilities and supporting geographical analyses. 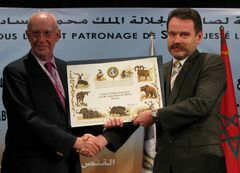 The prestigious Edmond Blanc Prize of the International Council for Game and Wildlife Conservation (CIC) awards outstanding efforts in wildlife conservation and game management that are based on the principles of sustainable use of wildlife. 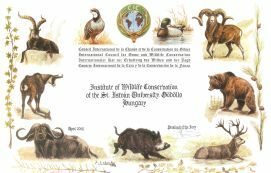 Database of Hungary - which is run by the Institute of Wildlife Conservation of the Szt. István University in Gödöllõ - has been awarded at the Closing Session of the 55th CIC General Assembly, held on 25 April 2008 in Marrakech, Morocco.